A 63-year-old man with locally advanced non-small-cell lung cancer presented with dyspnoea, cough and pleuritic chest pain. Examination revealed fever and dehydration with normal cardiovascular, chest and abdominal examination. Investigations: Alanine aminotransferase level 2760 IU/l, total bilirubin 25 μmol/l, alkaline phosphatase 188 IU/l, albumin 39 g/l, γ-glutamyl transferase 318 U/l, international normalised ratio 2.0, creatinine 205 μmol/l, white cell count 13.1×109/l. Screening for causes of acute hepatitis was negative, including hepatitis A, B, C serology, paracetamol level and autoimmune profile. 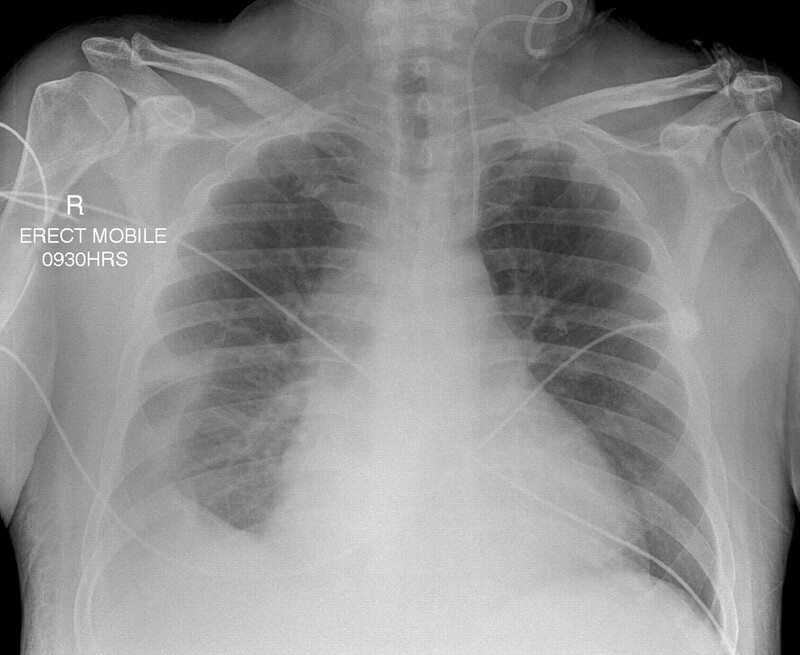 Chest radiograph showed right pleural effusion (fig 1). Electrocardiogram was normal. Chest radiograph. Note right pleural effusion. Liver and renal function progressively deteriorated (alanine transferase 4000 IU/l, total bilirubin 30 μmol/l, international normalised ratio 3.9, creatine 240 μmol/l). By day three of admission, he developed encephalopathy (asterixis), oliguric renal failure and a metabolic acidosis (pH 7.36, lactate 6.0 mmol/l). Doppler ultrasound scan of the liver showed normal portal veins but dilated hepatic veins. He then developed hypotension and tachycardia, and was noted to have marked periorbital oedema. 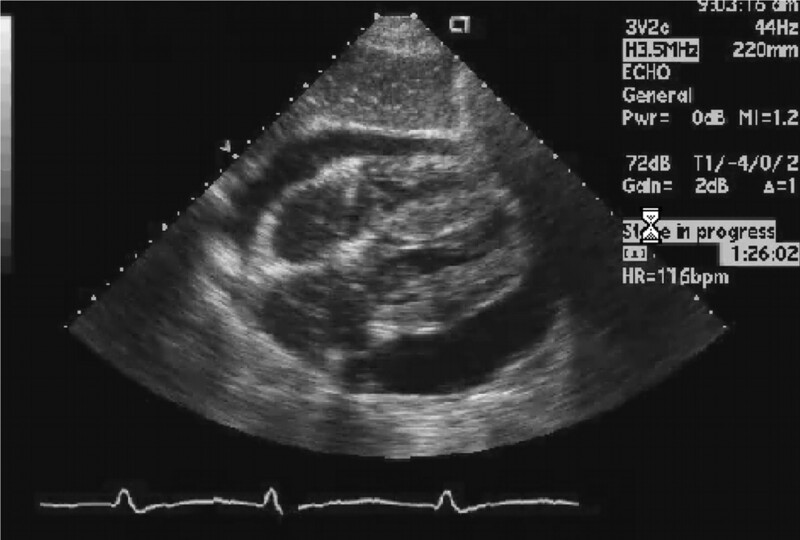 An urgent echocardiogram was performed (fig 2).